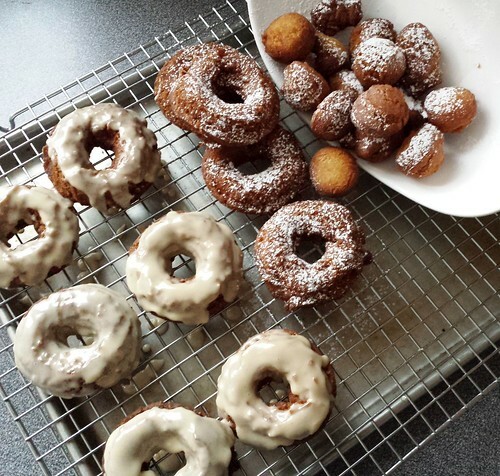 364 posts categorized "In My Sweet Kitchen"
Homemade doughnuts are always worth the trouble. The freshness of a doughnut minutes after emerging from a vat of hot oil is simply incomparable. Biting into that crispy crust enveloping soft fluffy centre makes all the work of deep frying worthwhile. Every time I make doughnuts at home, I always tell myself that I should do it more often but it is easier said than done. That’s good news for my waistline. When I made my Chinese New Year snacks last week, I planned out my schedule to incorporate a batch of cider doughnuts. I bookmarked the recipe for these cake doughnuts from smitten kitchen long ago but did not have a chance to try until recently. The use of apple cider reduction drew me to the recipe initially because it ensured a strong apple flavour without excessive liquid. However, it was simply another hurdle that caused me to procrastinate. Deep frying is already hard enough. Why would I want to add more cooking time by slowly reducing apple cider until it turns syrupy? Do you know Chinese tradition celebrates lunar new year for half a month? Last Thursday we officially kicked off year of the ram but it is still not too late to get in the celebration. That’s great news for me because I was so busy last week that I did not have a chance to prepare anything until the weekend. It seems only yesterday when I cooked new year’s eve dinner for my family followed by the publication of my collection of family recipes. Where did the time go? 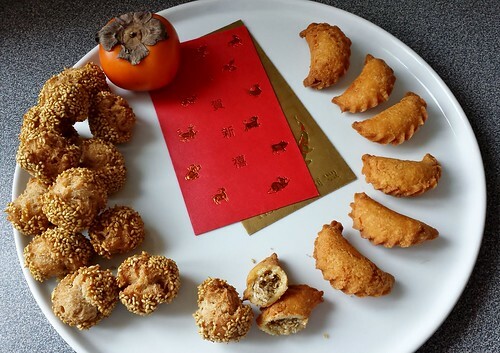 This year I challenged myself to make two traditional deep-fried snacks: sesame fritters 笑口棗 and crispy sweet dumplings 油角. They are ubiquitous in Chinese bakeries, supermarkets, and restaurants at this time of year. Honestly, it is much simpler to buy than to make at home. 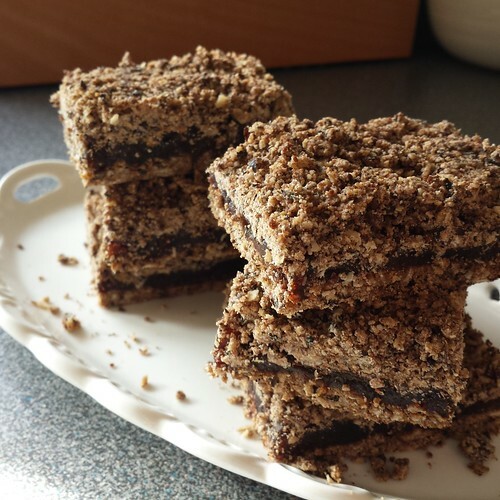 To make this effort worthwhile, I wanted to add my own twists to the traditional tastes. 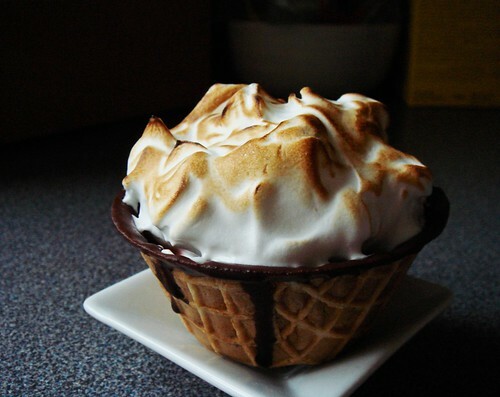 My ideal Valentine’s Day dessert is a contradiction. I want the decadence of chocolate but I don’t want to be weighed down by cream. 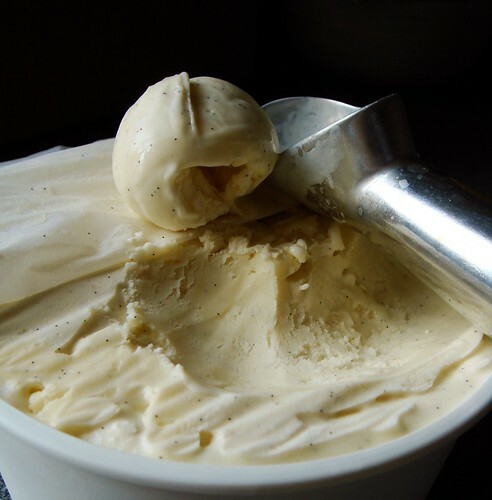 I want intensity and clarity of flavour but I don’t want to sacrifice delicate balance. I want to feel like I indulge but I don’t want to show proof by means of a bulging belly. After all, I want to look good and feel great on Valentine’s Day. I thought my ideal dessert does not exist until today. 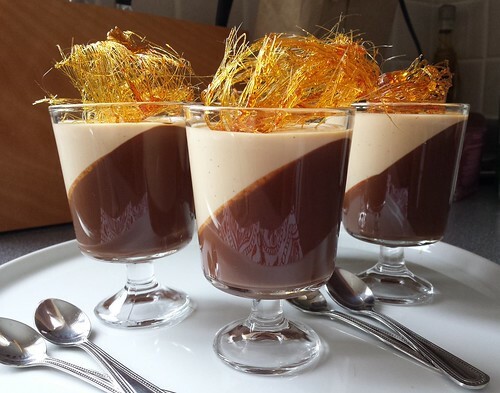 I present you Dark Chocolate Bourbon Gelée & Caramel Panna Cotta Verrine. I never thought of putting chocolate and gelée together. There is homely chocolate pudding, voluptuous chocolate mousse, sophisticated chocolate pots de crème. But a gelée made of only top quality dark chocolate, water, sugar, and bourbon? I was intrigued. Of course Hervé This long ago took away my fear of splashing water on chocolate as long as the proportion is right. But the idea of chocolate gelée still challenged my preconceived notion that gelée must involve fruit juice or puree. I had to find out. I made a resolution at the beginning of the year to push myself out of my culinary comfort zone. 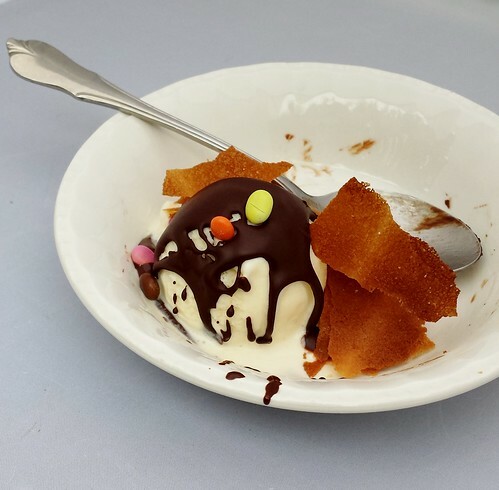 In 2014, I tackled unfamiliar cuisines, challenging baking projects, and childhood favourites that I thought I could only indulge while dining out. And let’s not forget I jumped feet first into the world of confectionery! Even though every project seemed a little out of my reach at the time, I learned from both successes and failures. I am confident to say that I have become a better cook thanks to a year of learning. Let’s take a look back at some of the highlights. Between travels to Sweden and my fascination with goodies sold at the IKEA Swedish Marketplace, I wanted to learn more about Swedish baking. Rather than wait for my next trip to the Scandinavia, I rolled up my sleeves and recreated the experience in my own kitchen instead. 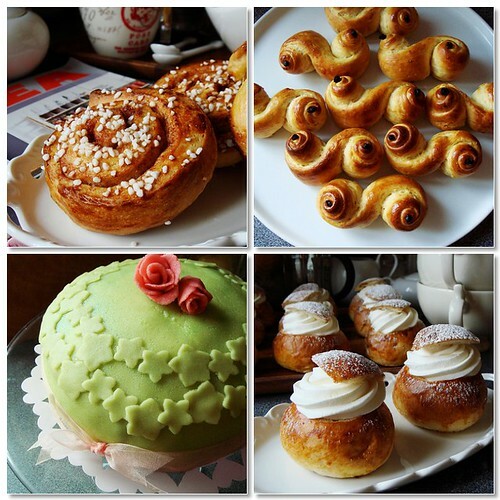 Last year I made kanelbullar (cinnamon buns), lussekatter (St Lucia buns), prinsesstårta (princess cake), and semlor (cardamom almond cream buns). I love them all, especially the technically challenging princess cake. It was the first time I made a dome cake freehand, covered with tinted marzipan, and formed little marzipan roses. Plenty of cake decorating techniques that I mastered in one baking project! It is Boxing Day in Canada and that means another Christmas has come and gone. Updates at Dessert By Candy were few and far between in the last few weeks. First I was overwhelmed with Candy By Candy pop up shop. Once that was over, I faced the conclusion of an important chapter of my professional life. After 14 years as a software developer, I bid (perhaps temporary, perhaps permanent) farewell to the tech industry. It is scary to leave the familiar and comfortable. Most emotionally-challenging though, is the fact that I no longer see my colleagues everyday. Fortunately, my mind is already pre-occupied by some opportunities ahead. I will be more involved with the food industry and there will be lots of new things to learn. I hope to share with you more exciting news as my plans take shape. As soon as I packed my belongings from my cubicle, I came home to prepare my kitchen for two baking classes. 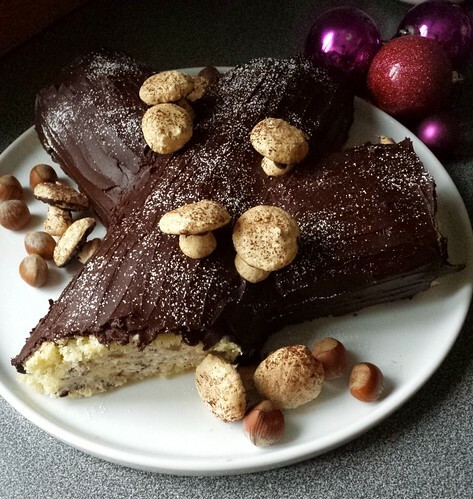 It is rare that I have free time on my hands so I sent out an open invitation to all my friends back in early December offering free baking classes to anyone interested. On Sunday afternoon, three friends came to my place and we spent an afternoon making double cheese & chive bread, sundried tomato loaves, and strawberry marshmallows. The following day, I guided a culinary-savvy 14-year old to make macaroni & cheese, pumpkin cinnamon rolls with eggnog glaze, and fluffy peanut butter nougat. 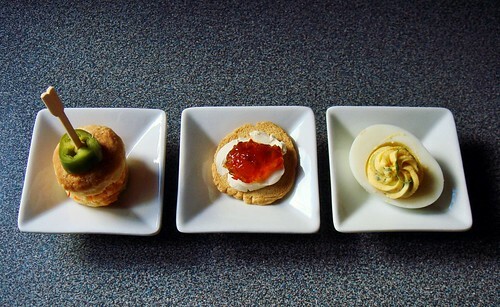 Three recipes in each class and all done in four hours flat, not a minute overtime! It made me so happy that my students enjoyed the class and picked up some useful tips. With everything going on, I somehow still managed to fill my days with plenty of holiday cooking and baking. Mind you, planning was minimal at best and I simply flew by the seat of my pants. Last night I finally had a quiet moment to organize the massive collection of photos I took over the last few weeks and made a mental tally. I must admit I outdid myself. Last Friday I catered my skating club’s end of year party at a friend’s home. I had an idea of the menu weeks in advance but did not flesh out the details until pretty late in the game. Luckily experience with cooking for large group came in handy and I drew on all the lessons I learned in previous years. So what makes for a good menu? I believe in eating chocolate for breakfast if the opportunity presents itself. Last time I made smitten kitchen’s Chocolate Swirl Buns it was a temporary farewell to gluten as I experimented with anti-inflammatory diet. It was a haunting reminder during those few weeks of what I missed out in the name of healthy eating. The diet experiment didn’t make me feel better or worse so I saw no reason to continue. 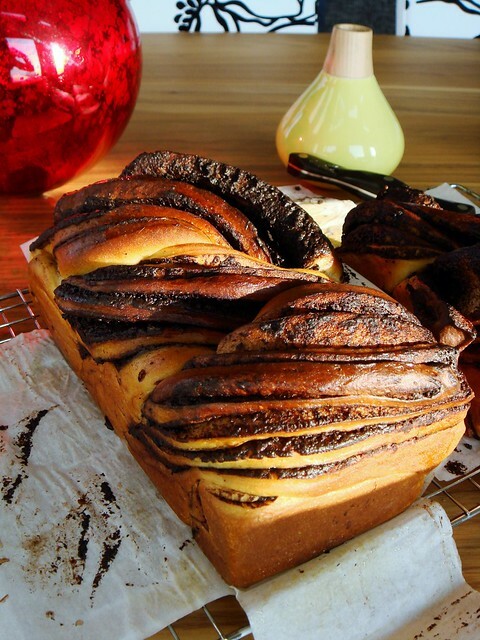 However, the sweet memory of those chocolate swirl buns, a twist on the more decadent chocolate babka, remains and I have to fight the urge to make them again. A couple weekends ago my friends and I had a girls weekend sleepover and I decided it would be the perfect excuse to revisit chocolate babka. This is the kind of decadence that is best to share among good friends. Coincidentally, smitten kitchen also revisited this classic and declared Yotam Ottolenghi’s supremacy over Martha Stewart’s version. Obviously I could not just take her words and had to decide for myself. I baked many birthday cakes for family and friends. Some were greatly appreciated. Some we ate with indifference. Some instigated arguments that made irreparable damages to relationships. I never know what kind of reaction my homemade birthday cake would bring yet I never give up on this small gesture. I like to think that cake brings people together in delicious way. 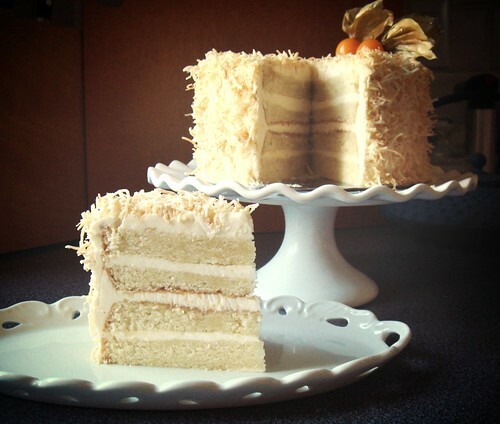 Last week I made a fancy four layer coconut cake for Dad’s birthday. The Cook’s Country recipe would yield a large 9-inch cake fit for a big party. I made a 6-inch and a 5-inch cake instead so it was not so daunting. The recipe was uncomplicated except for the use of cream of coconut (think Coco Lopez and pina colada). It took me a while to source this cocktail ingredient but it was effort well spent. It gave a huge boost of coconut taste in both the cake and the frosting.